3-5 business days. USA Only. A great everyday pack with excellent performance, fit, and functionality. Use it to offset your load, or for training and exercise. The Approach Pack is ideal for day hikes or overnight adventures. Ideal for day hikes and overnight adventures. 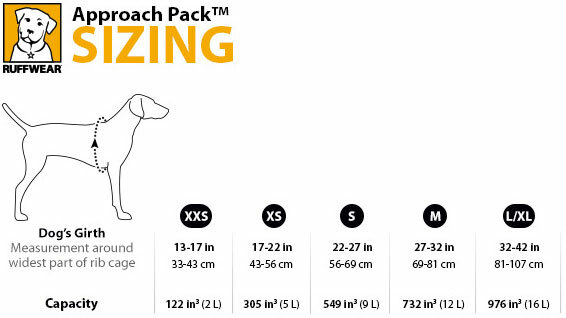 Recreational pack fits dogs of all shapes and sizes. Not sure? View the Ruff Wear Pack Comparison Chart to help find the one right for you. This item cannot be shipped to PO Boxes and APO/FPO addresses. If you purchase more than one Ruff Wear item, you may be eligible for a shipping discount - please contact us for a quote. Click the button below to add the Approach Pack to your wish list.